Lowrance fish finders have become synonymous with people looking to land the big catch, and if you’re looking to take your fishing to the next level than it’s time to upgrade. Locating fish and finding the perfect underwater environment are what these essentials will do for you while entrusting one of the biggest names in the business. We’ve field tested the best of the best Lowrance fish finders on the market and enlisted customers who have given us their own experiences in determining the best of the best. When looking at everything a consumer and true fisherman looks for in a fish finder/depth finder combo we’ve considered everything including price, reliability, performance, durability and much more while constructing our next review. The following review takes a closer look at the Top 5 Lowrance Fish Finders in 2018 while detailing all the reasons why. We start out this review launching not only the best Lowrance fish finder out there, but one of the best period. The HDS-12 GEN3 fishfinder/chartplotter combo integrates the best in innovative technology that makes even the most novice fisherman one of the best. This combo is an all-in-one solution to finding fish both onshore and off shore while giving you all the options you would expect in a high-end fish finder. The Lowrance HDS-GEN3 receives a full 5-star rating from consumers, but comes in with a modest price tag. If you’re looking for the best of the best you’re going to have to pay for it as this model is highlighted by an amazing 12-inch HDS display, but comes in a 9-inch model for those looking for something a bit smaller. 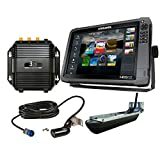 Out of the box everything is included such as a SpotlightScan Trolling Motor Transducer, TrollingScan Skimmer, GSP Antenna, dual micro SD card slots, ethernet cable, and much more. If you’re looking to fish with the big boys sometimes it takes the best equipment possible which is certain to separate you from the rest. Another 5-star rated fish finder/chartplotter combo is the Lowrance HDS-7 GEN3 Insight. This high-quality combo comes in cheaper than the model above, but doesn’t miss out on the quality that we’ve come to expect from a Lowrance fish finder. This model is highlighted by a upgradeable insight mapping for superior tracking and a StructureScan 3D Transducer for the best underwater mapping. The Lowrance HDS-7 GEN3 Insight fishfinder/chartplotter combo narrowly misses out the best of the year which shows it’s worth. This GEN 3 Insight features Med/High CHIRP and comes complete with an SS3D Transducer which does a great job of underwater scanning in all directions. For superior clarity, performance, and accuracy, this Lowrance fish finder/chartplotter combo has it all. Another high-performance fish finder is the HDS-7 GEN3 which offers insight mapping which is dubbed one of the best out there. This combo unit features everything you would expect including a StructureScan 3D Transducer, Med/High CHIRP and much more. The interface is where it’s at, and this Lowrance unit gives the user superior control with both multi-touch and key pad operation. The Lowrance HDS-7 GEN3 comes to you with all-positive reviews and is only one of a few with a perfect 5-star consumer rating. The high-quality viewable screen is easy to see under any lighting conditions and provides superior accuracy with underwater structures and fish. Offering smooth and fast transitions from screen to screen including charts, 3d scan, sonar, and radar is what helps separate the HDS-7 series apart from the rest. 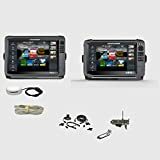 Deserving the 4th spot in this review is this HDS-9 GEN2 fishfinder/chartplotter combo which comes complete with transom mount transducers. Complete with everything you need to take your next fishing expedition to the next level while saving time and making it out to all the top spots. This HDS-GEN2 dominates the underwater while giving you clear imagery with a best-in-class underwater fish and structure finding display. The Lowrance HDS-GEN2 features an intuitive Touch Insight Display which offers crisp, clear colors which work wonders in any lighting conditions. The powerful touchscreen control is simple to use and the five push button controls makes it even easier without sacrificing performance. Complete with a four-channel sonar technology that’s built right-in, you’ll see underwater structures in full HD. Rounding out this review is another high-quality and recommended Lowrance fish finder/chartplotter combo that distinguishes itself from the rest with superior Insight Mapping. Lowrance has become well-known within the industry and its products like this which consumers have raved over with upgraded technology. This model was built to last and gives fisherman and navigators the peace of mind while tackling both onshore and offshore excursions. The Lowrance HDS-12 Gen3 features both medium and high Chirp and boasts a new innovative feature which gives the user optimum control. This Gen3 fish finder offers an intuitive where the user can touch operate using touch screen or push-button operation. This gives the user their own personal preference while considering water conditions. Hopefully, this review on the top Lowrance fish finders this year, and if not, be sure to ask your questions below.